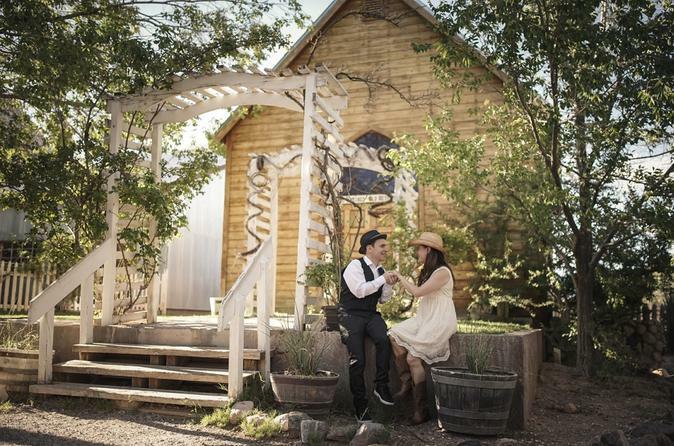 Skip the typical Vegas-style wedding and opt for the quaint Western Chapel located in Bonnie Springs near Red Rock Canyon. This western themed town offers a unique back drop for your special day. Round-trip transportation by limousine, wedding officiant, professional photographer, wedding cake and Champagne toast are included. Located less then an hour west of the Las Vegas Strip is the western themed town of Bonnie Springs, located just outside of Red Rock Canyon. Perched right in the middle of a western town, the Western Chapel offers a peaceful and scenic location for your special day. Your day begins with pickup by limousine from your Las Vegas hotel where you'll be transferred to Bonnie Springs. Your coordinator will be waiting to greet you and take you directly to the chapel for the ceremony. After you are happily married, you will enjoy wedding cake and a Champagne toast. Then you walk around this western town with your professional photographer for some memorable photos at various locations. Please note: the price displayed does not include the marriage license which you will have to purchase at the Clark County Courthouse for $77.00 (subject to change).